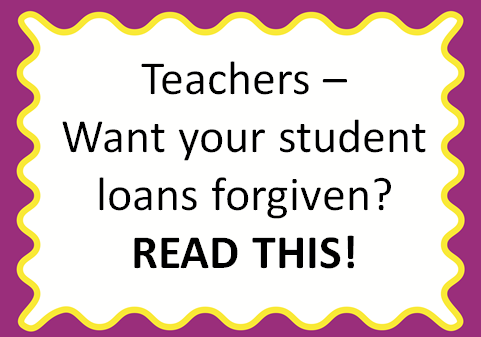 Teaching Blog Round Up: Can You Get Your Student Loans Forgiven? There is a real program out there that will give teachers student loan forgiveness of $17,500 or more! I personally received over $2,000 in Perkins loan forgiveness and another $5,000 Stafford loan forgiveness for teaching in a low income school for five years. You will want to read the official websites provided here as I am not an expert and had to utilize these website a LOT! Getting the loan forgiveness did take a bit of work on my part. I had to keep my address up-to-date at the colleges I attended, and there was paperwork to fill out yearly. So I had to bug my administrator/s each year to get them to sign the proper forms and I also had to keep myself organized so I could prove that I had copies of all the paperwork. I also had a bit of a run-in with one of my loan holders, but thankfully the DOE helped me work through that issue. If you'd like to read even more about this process, head over to my blog where I give you my student loan forgiveness process in detail. There's also quite a bit of discussion going on in the comments section at that blog post. It's definitely worth reading! And if you have any questions, ask away! I'll do what I can to answer them or point you in the right direction!! This post is not a guarantee that your student loans will be forgiven. I was not given loan forgiveness in exchange for writing this post. It is a real government program that may allow teachers loan forgiveness. Go to the Federal Student Aid website for further details and limitations. I wrote this post because the letter I received stated, "We hope that this payment will allow you to continue in this noble service and that you notify other eligible teachers about this program." I hope other teachers can benefit from me writing it! This is an interesting article. Student loans are a price to pay for going to college and can put you in a lot of Debt. This can be a serious issue, especially when you have other expenses. There are plenty ways to pay off your debt or student loans quickly. For example, you can pay the minimum or snowball your debt payments. You can also cash out your savings account, borrow from your 401k, or get a home equity loan. Obviously, using these methods depends on what your current revenue stream is. If you are in a situation when you need cash quickly, I would recommend researching sell structured settlement on the internet. This can help your receive a lump sum of cash quickly. Other methods are to cash out future payments and selling lottery winnings. On reading this post I can’t judge whether they get loan forgiven. In some banks they accept it and some more banks they will not accept it.